If you are looking to get away from the rat race and enjoy the quiet, uncomplicated, country air, or maybe take time out on a working farm or fancy a spot of fishing in one of New Zealand's revered trout and salmon rivers, then Coldstream Estate - The Whare is the place to come. Situated in a picturesque part of the property, Coldstream Estate - The Whare is surrounded by established trees. In recent years it has been lovingly transformed from former station cookhouse into private accommodation, while retaining as much of its historical character as possible. It is fully equipped with a fabulous large open-plan kitchen and dining room complete with cosy open fire, separate bathroom featuring a clawfoot bath, and a snug area with log burner. There is also a large outdoor area with BBQ for those long summer evenings or nights admiring interrupted views of the amazing Canterbury night sky, as well as a well-stocked library of books and DVDs available to bide time on those lazy days. 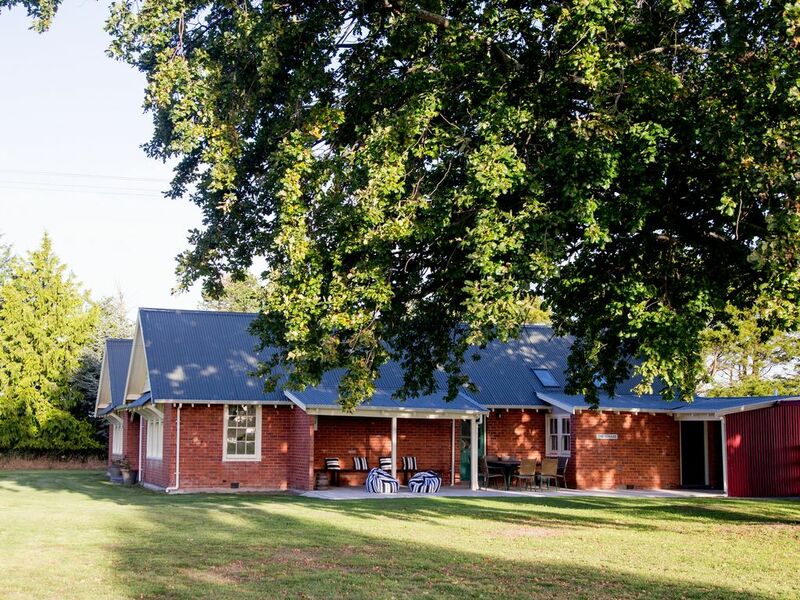 Bring your own food and enjoy the large outdoor dining area complete with BBQ or treat yourselves and pre-order a dinner hamper or platter or join your hosts for a relaxed country dinner in the main homestead. Your own personal chef can also be organised on request in advance, or if you would rather eat out, both Geraldine and Ashburton have a wide array of eating options. For those interested in farming, tours can be arranged with prior notice. While those keen on fishing are welcome to explore the mighty Rangitata River, with an unprecedented 5km of river access directly from the farm, or you can fish in the surf with the Pacific Ocean less than 2kms away. It's also a great place for walking and mountain biking with lots of farm tracks to enjoy, and ideally suited to base yourself from the in ski season with Round Hill Ski Area, Mt Dobson and Mt Hutt ski areas all within easy driving distance. If you fancy a long, deep soak in the bath, then The Whare's old claw foot is the perfect spot. Luxury shampoo, condition and body wash provided. Picturesque rural settings, located on Coldstream Estate, one of Canterbury's original runs. The Studholme family has been farming here for more than 150 years. The Whare is heated by a large wood burner in the entrance and lovely open fire in the living room. In addition, it also has two wall-mounted electric heaters in living room and master bedroom. The Whare also has a full laundry which has a washing machine and clothes dryer. Powder also provided. The Whare has a large open-fire in the living room as well as a log burner in the snug/entrance hall. The Whare has free wifi. Large open plan living room/kitchen area with huge 'L' shaped sofa and flat screen TV, with satelite TV channels. The Whare has a full-equipped kitchen where you will find everything you need. Some basic kitchen essentials, as well as tea, coffee and hot chocolate are provided. The Whare has an expansive open-plan kitchen/living area which features an 8-seater dining table. A children's highchair can be provided on request. The Whare has a wide array of books to suit all tastes and even has an on-site library, which was previously open to the community. We have a huge variety of DVDs available on request. Bikes are available on request. A BBQ area complete with seating for 8 and a BBQ is provided for lazy days enjoying the summer sun. Designated smoking area. No smoking inside.